Xcel Energy just cleared its biggest hurdle for plans to get 45% of its electricity from renewable energy sources by 2027. After a handful of delays and increasing doubts, the Colorado Public Utilities Commission (CPUC) announced that it would approve an ambitious power plan from Xcel Energy (NASDAQ:XEL) that will permanently reshape the state's electric grid. The utility will be allowed to retire two coal-fired power units representing one-third of its total coal capacity and replace them with over 2 gigawatts of combined wind, solar, and energy storage assets. It's not without controversy. Xcel Energy is confident that the $2.5 billion Colorado Energy Plan will end up saving ratepayers hundreds of millions of dollars over time, but the state regulator had doubts about the economic estimates. Failing to deliver the expected cost savings could have an impact on ratepayers and shareholders, as Colorado was responsible for 39% of the company's net income in 2017. However, the power plan future-proofs the business -- and it could actually end up saving over $1 billion. The power plan is approved. Here's what to expect. Last year, Xcel Energy boasted a power-generation mix comprising of 37% coal (well above the national average) and 23% wind and solar. The company also had a capital base (the value of installed assets from which customer rates are determined) of $25.1 billion. Both will receive a big boost from the Colorado Energy Plan. 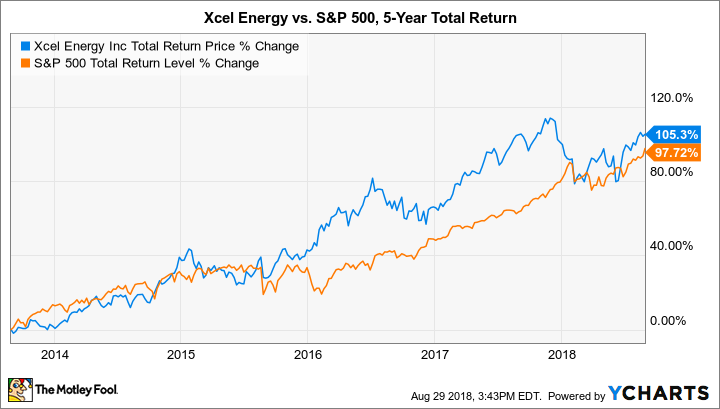 The regulatory green light means Xcel Energy will be able to expand its dominant position in American wind power and shift its generation mix to 22% coal and 45% renewables by 2027. Similarly impressive, the capital base will now grow to $36.4 billion by 2022, which represents a compound annual growth rate of 7%, up from an earlier estimate of 6.5%. That's music to the ears of income investors, who can expect the current annual distribution of $1.52 per share to grow even faster now. Retire: Two of three coal-fired units at the Comanche Generating Station with a combined power capacity of 660 megawatts. They'll be retired 10 years and 11 years ahead of schedule. Purchase: Two existing natural gas-fired power plants with a combined generating capacity of 380 megawatts. Build: Five solar farms with a combined power capacity of 700 megawatts, three wind farms with a combined power capacity of 1,100 megawatts, and battery installations at three of the new solar farms totaling 275 megawatts. It adds up to retiring 660 megawatts of coal and replacing it with 2,075 megawatts of renewables and 380 megawatts of natural gas. That will boost the share of renewables in Xcel Energy's generation mix in the state from 28% today to 55% by 2026. Once complete, it will also reduce the company's carbon emissions 60% from a 2005 baseline. That's good news for the environment, and although that's one consideration of the CPUC, the regulator is a little more concerned about protecting the wallets of ratepayers. The three-person panel approved the $2.5 billion power plan despite openly questioning the accuracy of the company's cost-savings projections, which the utility says will pile up to $213 million by 2054. That's not a lot of savings -- especially not over a nearly 30-year period -- to begin with, but regulators think the real savings will be even less. Some external observers think the power plan will actually cost ratepayers money. However, shareholders with a long-term mindset should consider the utility's argument, which is actually pretty persuasive. XEL Total Return Price data by YCharts. Xcel Energy argues that wind and solar farms don't have fuel expenses once built and are now the cheapest sources of electricity in Colorado. That should help to cancel out one of the biggest costs of the power plan: retiring the coal-fired power units early. While it's nice to think a power generator can just hang up its hard hat and walk away from its coal fleet, the reality is that regulated utilities have to weigh legal requirements around the financial accounting of accelerated depreciation of assets. Early retirement means the bill comes due sooner, and all at once. Ratepayers are usually stuck with the tab. Avoiding fuel expenses with renewable energy sources allows them to make up the difference in this case, according to Xcel Energy. Even though that wasn't enough to persuade CPUC, there's another huge cost that doesn't factor into the regulator's considerations: the social cost of carbon dioxide. It's a real thing. The U.S. Environmental Protection Agency abbreviates it as "SC-CO2" and defines it as the economic impact of emissions on healthcare costs, rising energy bills, reduced heating costs, and the like. By 2050 -- around the time Xcel Energy's cost-savings estimates end -- the EPA estimates that the SC-CO2 could reach $26 per metric ton to $212 per metric ton of emissions. While this isn't factored into economic or regulatory decisions today, it very well could be at some point in the next three decades. Therefore, the utility's 60% reduction in carbon emissions from the Colorado Energy Plan actually represents a huge cost savings, and it future-proofs the business from environmental and regulatory risks down the road. In fact, using the SC-CO2 (although the exact per-ton value used isn't clear), Xcel Energy estimates that its latest shift toward renewable energy will end up saving over $1 billion. That could end up saving long-term investors quite the headache -- something other power generators can't claim. Xcel Energy's Colorado Energy Plan is a win all around. Shareholders can expect the increased capital base to grow its revenue, earnings, cash flow, and dividend at a faster pace than previously estimated. Ratepayers should save money on their utility bills, or at least not be on the hook for the accelerated depreciation associated with retiring coal assets 10 years ahead of schedule. And everyone wins from a steep reduction in carbon emissions that avoids risks from increased social costs and potential regulatory burdens, including future shareholders. Who knows, that could be a future version of yourself, albeit decades from now.